Please forgive me if I sound a bit self-aggrandizing, but I like to think I'm a fairly astute student of history. "The Roosevelt: An Intimate History" has taught me plenty of things that have gotten past me over the many years of my life. Leave it to Ken Burns, the acclaimed documentary filmmaker to offer an in-home lesson on one of the nation's greatest political families. The series concluded Saturday night on Panhandle PBS. It was 14 hours long and every single minute of it captivated me. * Theodore and Franklin Roosevelt were fifth cousins. I had known they were related, but I didn't know the precise lineage. * Eleanor Roosevelt developed a relationship with a woman with whom she spent long periods of time -- just the two of them. The series didn't address the precise nature of their relationship, but I am left with the impression that it was of a romantic nature. * The Roosevelt family was divided by rivalry between the Oyster Bay wing (Theodore's family) and the Hyde Park wing (Franklin's family). * Franklin and Eleanor's children tried to hide the relationship that Franklin had with Lucy Mercer. They tried, but Eleanor knew it all along. * Sara Roosevelt, Franklin's mother, was a powerful influence on his life until the day she died. * Eleanor and Franklin did not live as husband and wife for decades. * Franklin Roosevelt suffered from an inferiority complex as a child. * Franklin's polio taught him empathy, which he shared with those who suffered physical disabilities. * Theodore Roosevelt Jr. opposed our country's involvement in World War II. Still, he attained the rank of brigadier general in the Army, landed at Utah Beach on D-Day and died of a heart attack while leading his men past the beachhead. * TR Jr. was awarded the Congressional Medal of Honor for gallantry. 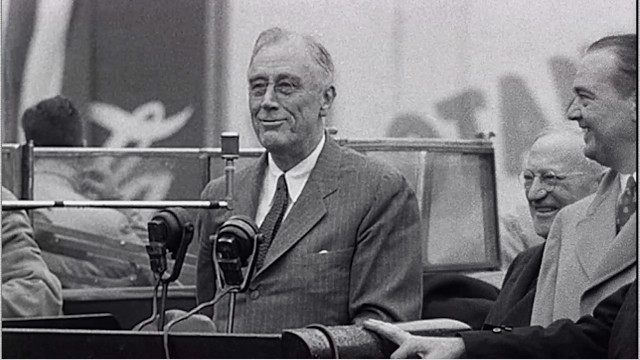 * Franklin Roosevelt was basically a dying man when he was re-elected in 1944, suffering from congestive heart failure. * FDR delivered his only wartime inaugural address from the White House instead of the traditional location at the Capitol Building. His speech was the second-shortest in history; the shortest was delivered by George Washington. * Eleanor Roosevelt remained politically active after her husband's death and she thought that Sen. John F. Kennedy was too young and inexperienced to be elected president. In fact, she worked to nominate Adlai Stevenson at the 1960 Democratic National Convention in Los Angeles. There's probably more that I learned that I cannot think of at the moment. The series was a spectacular bit of television. I could watch it all over again ... and again. If you missed any of the episodes, you can watch it online until September 30.